Helping transition your family member into a safe and stimulating residence they can call home. Is your loved one with autism transitioning to adulthood? Maybe you feel overwhelmed when it comes to figuring out where they will live, if not with you, so they can continue to receive the care and support they need. And, if that’s the case, you’re not alone. One of the most challenging parts is finding the right group home for adults with autism. Our mission is to make it easier for you by providing a personalized residential living plan that is specially developed to support and help an individual with autism reach their full potential. If you’re wondering whether or not a residential living program at The Brambles is right for your family member, explore what makes us different from the rest. Additionally, we offer scheduled routines and optimal strategies to avoid meltdowns and effectively handle outbursts. The journey to residential living can be daunting for any family. We feel it’s an absolute must to keep an open line of communication between you and your loved one. We also cultivate a support team for you and your family, which is made up of The Brambles’ staff and support coordinators, allowing you the opportunity to provide suggestions and get the support you need throughout the transition. At The Brambles, your family member has the option to bond with other residents and the community through planned in-home activities and events, as well as recreational outings to the bowling alley, movie theaters, beach, and more. We recognize the importance of adhering to a scheduled, familiar routine. This is why transportation and support services are all done right here on our property at The Brambles Day Support Center. This enables our residents to look forward to engaging with familiar drivers and day program staff members. 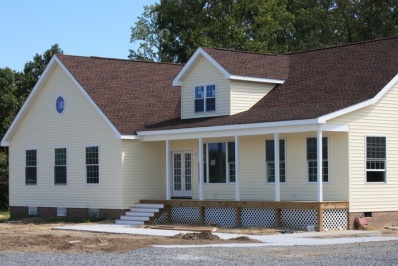 The Brambles owns and operates ten private group homes for adults with autism, each within Mathews County on Virginia’s Middle Peninsula. Each residence is custom-built within a neighborhood-like environment and features various amenities designed to support intellectually and physically disabled residents who have shared interests and behaviors. Ready to discover a place where your loved one is fully supported 24/7? Explore the following residence options we have to offer. The Bella Terra Road location features six group residences set on 55 acres of land. These large, open-space living environments offer comfortable furnishings, large gathering kitchens, and spacious modern bathrooms. Additionally, each group home is equipped with wide screen TVs, puzzles, and board games which provide residents with entertainment, and the opportunity to socialize or quietly relax. Approximately three miles from Bella Terra, the New Life Harbor location features two group residences set on 84 acres of active farmland. Located between Bella Terra and New Life Harbor is the Windsor Residence, which is newly renovated to meet our highest standards. Here, we can successfully serve the needs of ID adults while giving families the peace of mind their loved one is fully supported. The Brambles encourages adults with autism to live with as much freedom and independence as they wish. Our group homes and day support services provide ongoing support for the individual and assist them in living the highest quality of life possible. You may download a brochure to find additional details on our group homes for adults with autism, as well as information on our day services. Contact us for more information on The Brambles’ adult group homes or to schedule a tour.